Eastbound I-74 bridge traffic is blocked by a crash near the State Street ramp. This Iowa DOT webcam shot shows eastbound traffic backed up on Interstate 74. 12:15 p.m. UPDATE: I-74 has been reopened to traffic. Interstate 74 has been shut down because an accident took place near the State Street ramp onto the eastbound lanes, according to police scanner reports. Davenport Chief of Police Paul Sikorski, left looks over an overturned vehicle on the I-74 Bridge Tuesday February 5, 2019. Sikorski said there was a gun incident which led to a pursuit and the crash that involved a Davenport Police Department vehicle. One person was arrested. 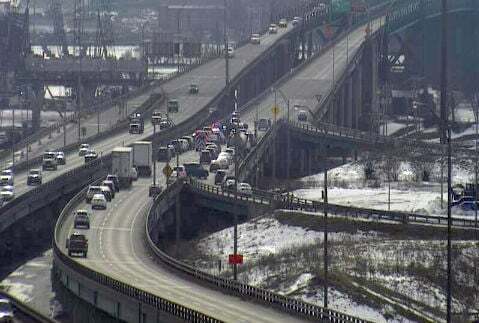 Multiple law enforcement agencies responded to the scene of a crash on the I 74 Bridge that involved a Davenport Police Department vehicle Tuesday February 5, 2019. Davenport Chief of Police Paul Sikorski said there was a gun incident which led to a pursuit and the crash. At least two individuals were transported by ambulance from the scene of a crash on the I 74 Bridge that involved a Davenport Police Department vehicle Tuesday February 5, 2019. Davenport Chief of Police Paul Sikorski said there was a gun incident which led to a pursuit and the crash. Multiple law enforcement agencies responded to the scene of a crash on the I 74 Bridge that involved a Davenport Police Department vehicle Tuesday February 5, 2019. Davenport Police Department photograph a vehicle on the I 74 Bridge after a crash Tuesday February 5, 2019. One individual is loaded into a Medic ambulance and transported from the scene of a crash on the I 74 Bridge that involved a Davenport Police Department vehicle Tuesday.